Between the Lines now available! Thanks so much to Tracie at The Crochet Studio for testing for me again! 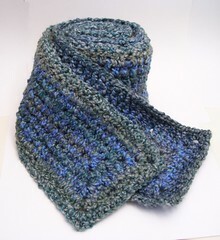 Update: It’s now posted for sale on Ravelry, on Etsy, and right here at the site. This entry was posted in Business, Crochet, Design on September 29, 2008 by deb. 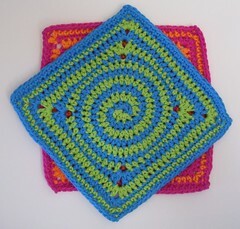 Spirals and dishcloths are two of my very favorite things, and I couldn’t resist the urge to combine them. I have to say that I’m pretty happy with the result! I’d like to extend a huge thank-you to Tracie at The Crochet Studio for testing this pattern for me. Any errors that might still be lurking are there despite her attempts to straighten me out. 🙂 Also, I’d like to note that she’s also got a pattern out in the last few days that I was lucky enough to get to test for her: Sunny Picots Coaster. It’s beautifully written, easy to follow, and the finished coaster is stunning. And now I’m off to celebrate by working on the next one, lol. Good night! This entry was posted in Business, Crochet, Design on August 4, 2008 by deb. A year ago today, I listed my first item on Etsy. I could wax rhapsodic over everything that’s happened since I took a deep breath and hit that button to put that first item live (where ohmygoodness someone might see it and buy it and what then? ), but it seems more a time for celebration than introspection. This entry was posted in Business, Crochet, Design, Life on July 5, 2008 by deb. Had a great first few days for the new pattern. Yay! I’m into my regular workweek now, so a bit scarce the next few days. As soon as I get a chance, though, I need to take some fresh pictures of fresh works-in-progress, because it’s been too long since we’ve had a picture post around here. I’ve got a lovely drop-stitch scarf on the needles, I’m knitting dishcloths, and I’m trying to decide what to add to the list now that the blanket projects have been put away for the summer. Hmmmmm…. This entry was posted in Business, Crochet, Design on June 20, 2008 by deb. Well, the pattern is out there. Now the breath-holding until (hopefully) someone buys it and likes it. I always find this part of the thing rather nerve-wracking. Other than that there’s not a lot happening in crochet-land just now. I was hoping that I’d get a chance to work on the new dishcloth today, but the kids are acting possessed. So I should probably find something to clean instead. And tomorrow it’s back to work. Um, yay? LOL. This entry was posted in Business, Crochet, Design on June 18, 2008 by deb. I think I just developed a total blog crush on Fleegle. This entry was posted in Business, Design, Life on April 24, 2008 by deb. My patterns are now available for sale as Ravelry downloads! Yay! If you’re on Ravelry, you can grab them there, I’m neatlytangled and the store is ‘Neatly Tangled Designs.’ If you’re not, I’m hoping to get buttons up here by the end of the day. I’ll update when I’ve managed to get it done. I’d hold off announcing it all if I weren’t so excited! LOL. This entry was posted in Business, Crochet, Design on March 13, 2008 by deb. Thought I’d give it a try, because I figure the best that can happen is that they bring in a little sorely needed cash, and the worst that can happen is that they are problematic enough in one way or another that I have to take them down. They’re set so that nothing “not safe for work” should show up. If you see anything objectionable, drop me a line (neatlytangled at gmail dot com). I’ve got the thing set to run without my interference, since I’m not at my computer all day to be able to babysit it. This entry was posted in Blogging, Business on February 17, 2008 by deb. The great destash of ’08. All sold! Thanks so much! This entry was posted in Business, Life on February 6, 2008 by deb.